Karate was originally developed in Okinawa from indigenous fighting methods called te and Chinese kenpo and Kung Fu. Uechi-Ryu (also known as Shohei-Ryu) is a Karate system which provides the student with a rounded fitness program for the body, mind and spirit. Shohei-Ryu Karate was developed from the Tiger, Dragon and Crane fighting systems of the Shaolin Temple in Southern China. 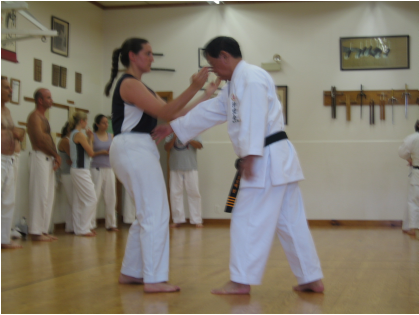 Basic self-defense strategies in Shohei-Ryu include blocking, grasping, punching, knee and elbow strikes, kicks to the legs and torso, evasive movement, sweeping, and throwing (appropriate to age levels). Shohei-Ryu emphasizes the use of the Shoken (one-knuckle fist), Wa-uke (circle-block), Nukite (spear-Hand), and the Sokusen (toe-kick.) For a brief history of Uechi-Ryu and Shohei-Ryu Karate click here. The greatest benefit of practicing Shohei-Ryu Karate in the modern era is the development of the mind, body, and spirit in a positive and constructive manner. In doing so, the practitioner is said to be a student of Karate-do, whereby they can maintain a higher level of overall health and fitness. Although Shohei-Ryu provides valuable skills for self-defense, the personal development aspects of long term practice can be far more rewarding to the student. Consistent training enhances the student’s strength, flexibility, endurance, and coordination concentration, focus, self-control and the ability to relax! 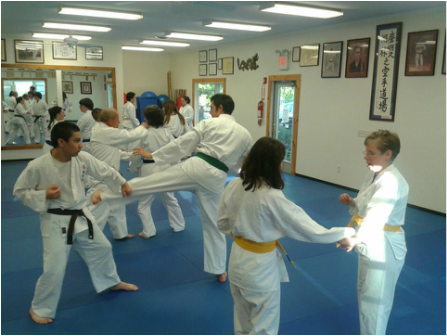 Shohei-Ryu students at the ZenQuest are grouped into several Student Divisions according to age, capabilities, and experience to maximize each student’s learning. For information on our Karate program for Youth (under 13) please visit Youth Karate. The school features a knowledgeable team of experienced Instructors and support staff under the direction of Senseis Mark and Connie Flynn. High standards of instruction and authenticity are maintained under the guidance of Masters Shigeru Takamiyagi (Hanshi 10th Dan) and Toshio Higa (Kyoshi 9h Dan) of Okinawa, Japan. Rank Certifications are issued by the Okinawan Karate-do Association. For information about the rank system and support information click HERE.